peek >> << backNew Jersey Avenue north of I Street, October 2003. Park Chelsea Expanded Photo Archive. Feb. 28, 2016 - The Park Chelsea as seen from New Jersey and I, with the leasing office now open. Feb. 11, 2016 - The main entrance, on New Jersey Avenue, SE. Feb. 11, 2016 - Almost as anticipated as the completion of the building itself was the opening of a new block of I Street between New Jersey and 2nd, which finally opened on February 8, 2016. Jan. 2, 2016 - Zooming up to the roofline to see the detail on the panels covering the false front at the roof line. 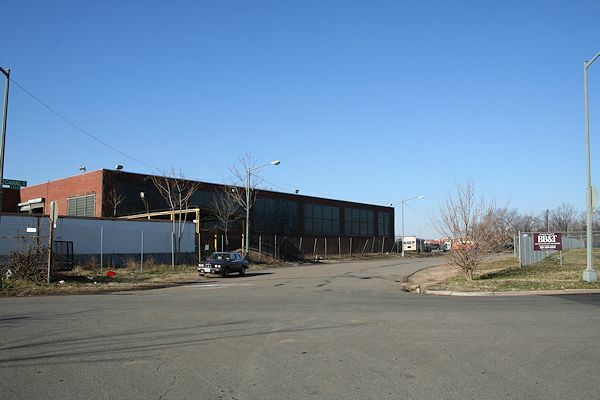 January 8, 2012 - The northeast corner of New Jersey and I, the same angle as the rendering, in January 2012, before the trash transfer station was demolished. December 10, 2016 - The same angle, with construction nearly completed. Jan. 10, 2015 - For now, the Park Chelsea is a large portion of the view from the Southeast Freeway, though this will only last until its sibling 800 New Jersey goes vertical. June 9, 2014 - A first peek inside the building, looking at the ground-floor amenity spaces. See this gallery of a June 2014 project tour for more interior shots. June 9, 2014 - Standing on the roof during construction, looking down toward the courtyard but also glimpsing the famous neighbor to the north. And the freeway. Note that 800 New Jersey is being built between the Chelsea and the freeway, so this view is temporary. August 21, 2003 - Looking to the northwest at 2nd and I streets, during the block's life as a parking lot. March 23, 2019 - The same location, with construction moving along (and with Agora now rising to the north). July 14, 2005 - Moving away a from the Park Chelsea's lot a bit, to the corner of 2nd Place and K, back when it was just an overgrown parking lot. March 17, 2019 - The same angle, already vastly changed with the 2012 arrival of Canal Park but soon to have the Park Chelsea (center) changing the vista, too. 1992 - An overhead photo of Square 737, when it was occupied by a warehouse. The main white building was a beautiful marble-or-limestone turn-of-the-century structure; it was demolished in 2000, and I weep every time I think of how I never got my own photo of it. (Waaaaaah!) From the Library of Congress Historic American Buildings Survey Virginia Avenue Collection. May 2008 - A similar view of Square 737, this time from on top of 100 I Street in May, 2008. The building at rear is the old Post Plant at 225 Virginia Avenue. June 26, 2012 - The northwestern corner of the old DPW site known as the trash transfer station sat on the footprint of both the to-be-built I Street and some of the Park Chelsea land, and so it had to be demolished before work could begin on the apartment building and the infrastructure work below. That finally happened in the summer of 2012. June 26, 2012 - When people described the "deep" infrastructure work that had to be done on Square 737 before construction could start on the Park Chelsea, they weren't kidding. June 26, 2012 - Looking at the Park Chelsea footprint from the trash transfer station ramp, during demolition. If you have x-ray specs, you can see the Freedom statue on top of the Capitol dome just behind the freeway. This location is where the new I Street will run. 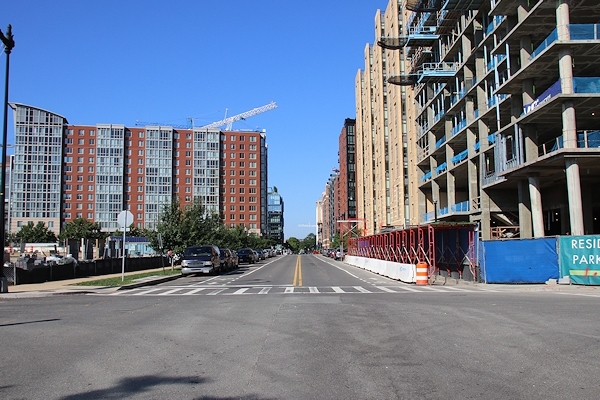 June 26, 2012 - Turning a smidge to look more at the Park Chelsea site, which for a number of years was a parking lot. July 18, 2006 - Before work began to redevelop Square 767, Canal Street ran on a strange northwest-then-north path through the block. Here is Canal's northern jog, on its way to H Street in the distance. July 18, 2006 - Turning around and looking south on Canal back to the trash transfer station, and over to the old Post Plant at 225 Virginia.